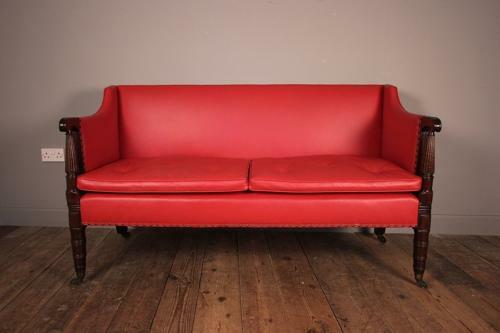 A small George IV Mahogany sofa with red leather upholstery. Having a scrolled reeded arms and raised ring turned front legs of which retain the high quality original brass cup castors. The sofa having a 2 button swab cushions and deep seat. Although not newly upholstered the condition of the leather and upholstery is in very good order. English, Circa 1825.